Bon Appétit. It's a fast, easy, and fresh way to liven up your dinner table. It seems that sage goes off the grid after appearing in many Thanksgiving dishes. Don't you think? There is no reason for this. This dish will keep it alive and well. Sage + Butter = scrumptiousness. The sage leaves not only infuse the pork with great flavor, but when fried to a crisp in the oil, they add a wonderfully crunchy textural element. 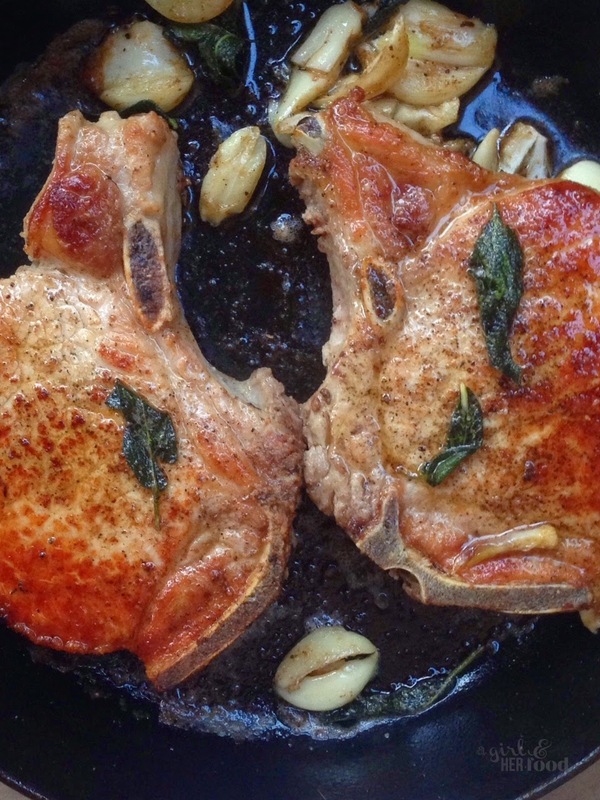 I suggest making this pork chop stat and you will have dinner on the table in under 15 minutes! Heat oil in a large cast iron skillet over medium-high. Season both sides of the pork chop with salt and pepper including the fat cap. Cook the pork chops until bottom side is golden brown, about 1 minute. Turn and cook on the chop on the other side more about 1 minute before turning again. Repeat this process, turning about every minute until the chops are deep golden brown and an instant-read thermometer inserted into the thickest part registers 135 degrees. The cooking time for this should be 8-10 minutes depending on the thickness of the chop. Remove from heat and add sage, garlic, butter. Tilt the skillet and spoon foaming butter and drippings over the pork chips, making sure to baste the whole chop. Transfer the chops to a cutting board and let rest for about 5 minutes. Place the chops onto a plate and pour any remaining juices from the cutting board. I even spooned some sage and garlic from the cast iron pan onto the chop. Enjoy!